On May 19th 2011 H&M the international design-driven clothing retailer will launch a new range of cosmetics in Kuwait. Will be available @ the Avenues, Marina Mall & Salmiya ! 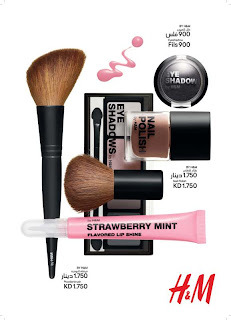 The new collection offers a wide range of cosmetic products including eye shadow, eyeliners, powder, foundation, nail polish and lip gloss, all available in carefully coordinated colours that are updated each season and are coordinated with H&M's women's wear trends. Bodycare products and accessories are also part of the available collection. The range collection also includes special ‘seasonal series , offering products themed on popular comic characters such as Minnie Mouse and Hello Kitty as well as self-designed H&M packages that follow seasonal trends in general. The seasonal range contains make-up, body products and various accessories.